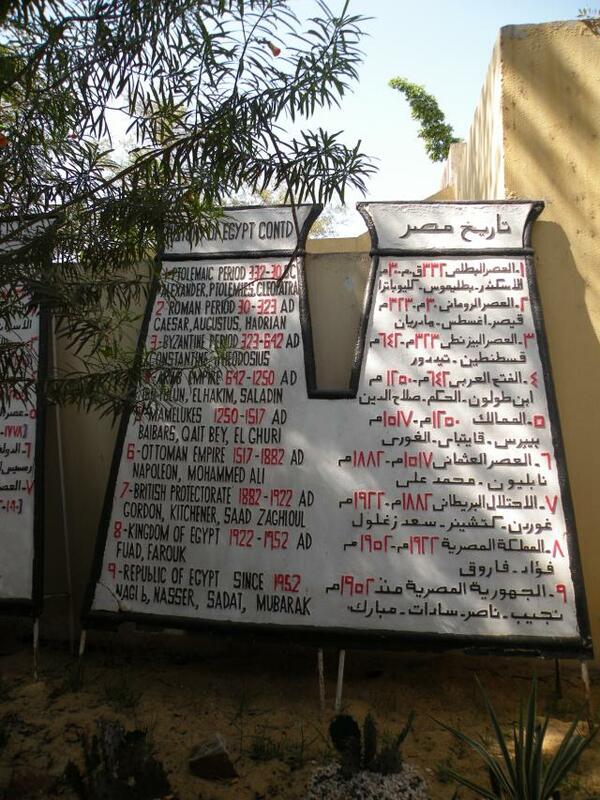 This timeline of Egyptian history at Dr. Rageb’s Pharaonic Village in Cairo, needs a new line to mark a new moment in Egyptian history. In Egypt, after 18 days of anxiety, camaraderie and hardship, nobody wants to talk much about what comes next. This is the time of celebration. The long road to a new political, social and economic reality can come tomorrow. The emphasis in most political commentary has been on the capacity of the crowds to overturn the thirty year old Mubarak regime. But Mubarak’s resignation today, in the face of historically unprecedented public outcry, is of far greater historical importance. If one takes the longue duree, it is clear that the Egyptian people have never had any real voice in their government. The rule of the Pharaohs has been frequently applied to Hosni Mubarak to describe purely autocratic rule. From around 350 BCE Egypt’s ruling classes were composed of foreigners—foreign both in terms of heritage and languages spoken among them, but also in the perception of the indigenous Egyptian population. These foreign ruling classes (Greeks, Romans, Ottomans, French, Britons) in turn encouraged other foreign groups (Armenians, Greeks, Iranians, Jews, Lebanese, Syrians, Turks) to reside in Cairo and act as intermediaries between the rulers and the indigenous population. The 1952 revolution finally put Egyptians in power again, but hardly with a representative government. Nasser’s socialism established the concept of a strong central government centered on a paternalistic leader who rules for the good of the people as whole–a legacy Mubarak sought to invoke in his sad, disappointing last speech. The Egyptians do not have a democratic government yet, but the moment is pregnant with opportunity. The tension of opportunity and risk, as much as the sense of relief and exultation of victory accompanying Mubarak’s resignation, fueled this night’s celebrations. I do not know if Egyptians will achieve a liberal democracy of the type I would wish for them, and that I know many of my Egyptian friends and former students desire: free and fair elections, independent judiciary, civil society, and rule of law. I do not know if this is the wish of the Egyptian majority, many of whom might be willing to trade liberal democracy for jobs and decent living conditions. But what I do believe is that the impact of eight million people protesting throughout the country will not be lost on the planners of the new government. I believe the Emergency Law will be scrapped, freedom of expression will expand dramatically, and some form of more responsive government will emerge. Bukrah, insha’llah (“it will happen tomorrow, God willing”), as we say in Egypt. Except maybe one of the great changes is that we will say it with hope, rather than resignation.